This will be a busy end to the season. Although the regular season games are coming to a close there will be plenty of make-up games due to a few rainy days. Don't forget the post-season tournaments. To sign-up check the website or contact your local assignor. Do you have a 2009 badge? If you don't have one yet that probably means you haven't re-certified. Please check the calendar for classes in your area. If you don't see one available keep checking back as we update that information frequently. There is still time to email Kris Grano to be considered for ODP Championships in Phoenix, AZ but time is running out! Limited number of spots available so act now or you'll have to wait until next year. As this years draws to a close its time to start thinking about... next year! Have you been thinking about upgrading? If you have then its important to review the requirements. Decided to move forward? Great! Follow the directions on that web page to declare your intent to upgrade in time to start in 2009. The SRC will be hosting a training session geared towards new and youth referees during the second weekend of the Gaylord Shepherd tournament November 15-16. We invite everyone who is interested to email Kris Grano so that you can be considered. There are limited spots available so please let us know as soon as possible. If you know someone who would be a good fit for this program you can nominate them by sending an email, as well. Referees that are selected will be given special game assignments, receive a free shirt, be paired with mentors and have the opportunity to win prizes. Food will be provided during post-game feedback sessions where we will have group discussions. This is an excellent way to improve your skills and interact with fellow referees. Participation may be considered when we are selecting referees for future events, including Far West Regionals, so we strongly suggest applying. If you have any questions please email Kris Grano. Don't rely solely on your cards. We have a lot to manage out on the field: players, coaches and fans all require our attention. Do you ever find yourself running into a situation that wasn't covered in the referee class? Of course! I know that I've seen plenty of situations that don't show up on a page in the Laws of the Game. So where do we go to find the answers? US Soccer has lots of articles discussing some techniques that work for a lot of referees. They are not a perfect fit to our normal games (did any of you do a MSL game last weekend? I didn't.) but they can provide some guidelines on which to build your style. 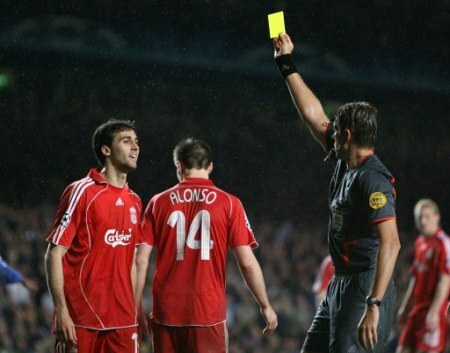 So if you'd like to learn about getting more out of your yellow card click here. You are receiving this email communication because you are a currently registered soccer referee in New Mexico. Copyright (C) 2008 New Mexico Soccer Referee Association All rights reserved.